For Esimit Europa 2, one of the world's fastest and technologically most advanced sailing yachts, racing at UK's Cowes Week proved to be a big success after taking line honours at both Big Boat Series races. All-star European crew was joined at training by Edward Wright, European and World Finn Class Champion, and is now getting ready for the start of one of the world's toughest offshore races - Rolex Fastnet Race. We have chosen the right strategy and tactics, which crowned us with line honours. The Esimit Sailing Team, composed of the best sailors coming from 10 different European countries and lead by German sailing legend, skipper Jochen Schümann, finally awaited its first racing challenges in the UK. Sailing in the Solent channel, close to famous Isle of Wight, turned into a big success with two convincing line honours taken by a significant margin to the nearest competitors; among those mini maxis Bella Mente (USA) and Ran (GBR) and Volvo 70 Azzam (UAE). Cowes Week is one of the UK's longest running (since 1826) and most successful sporting events with over 1,000 boats participating. It often serves as a general rehearsal and last check for one of the highlights in the world of sailing, the Rolex Fastnet Race. The toughest, most dangerous, exhaustive and highly reputable are common expressions associated with the 608 nautical mile (1,126 kilometres) race from Cowes to Plymouth rounding the Fastnet rock, passing the southern tip of Ireland. 2013 marks the 45th edition of the biennial race. Starting on Sunday 11th August, the race will see the record fleet of 350 yachts from over 20 countries and five continents. Founded in 1995 by Igor Simčič, the Esimit Europa project, represented by the Esimit Europa 2 yacht and the Esimit Sailing Team, aims to promote pan-European cooperation and spread a sense of common European identity through the unifying power of sports. The 30 meter long, 5.3 meter wide, yacht with a 44 meter high mast, on board joins 18 highly skilled sailors, coming from 10 different European nations. With a maximum speed of more than 38 knots it is one of the world’s fastest monohull yachts. Inspired by the Esimit Europa's main message “All together – for Europe,” the Esimit Sailing Team sails under the flag of the European Union and promotes the sailing values of teamwork, solidarity, innovation and collaboration. 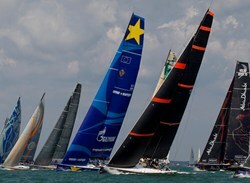 Since its christening in June 2010, Esimit Europa 2 claimed 24 line honours at the 24 races attended and set six records. Its main sponsor is the global energy company Gazprom, while BMW is the official partner. The project is under the patronage of the President of the European Commission, José Manuel Barroso, and is endorsed by Martin Schulz, the President of the European Parliament.